In this video GoFloaters founder, Shyam covers one of the biggest mistakes a startup founder can make. The mistake is about building the product for many. What should I be looking for in the office for my business? This question is a very important question that you as the founder of a business needs to be very careful answering the question. The short answer is actually a question “What are you looking for?”. I know that you are not expecting an answer and not rephrased question. Still I would urge you to answer what are you looking for from any office. If you are able to answer this then, I am very sure that you will be able to answer the question on what to look for from a office space. You may want to checkout this checklist that we put together on what should one look for from an office space. This office space could be that bedroom in your home, or a small rental office or a coworking space. The “BIG” difference between a coworking space and a business center is the opportunity to network with other tenants of the space to look for opportunities to collaborate and the events that the coworking space hosts that may be of use to you. Yes, coworking spaces look flashier than your traditional office. Yes, some of them would offer free unlimited coffee. Yes, some of them would have recreational facilities for you to relax. The question to ask is that do you need these or are you at a stage where you would spend every single rupee that you have into the business than on these frills. For those reading this post. Please let me know by commenting with a “yes” if you found the checklist useful. If you want to add something more to the checklist please comment too. We are happy to share with all GoFloaters customers, that we are able to offer you an exclusive discount from Budli.in for both buying gadgets from them or selling gadgets to them. Budli.in is India’s premier ecommerce and recommerce player. They have been featured by BBC, Fortune Magazine and CNBC. This introductory Video Clip about Budli.in will explain what they do. Use the discount code “GOFLO5” (as provided in the image above) to avail an additional 5% discount and save your business upto 60% on device cost or get the most value for your devices. Before we get into the cheap ways of building an MVP, I think it makes sense to talk about what is an MVP and why a startup like yours needs an MVP in the first place. I think it is probably best also to say what is not an MVP. If you are someone who knows all of this and are just looking at ways in which you can build an MVP then skip ahead to the section “Cheap ways to build or make an MVP”. For those who have not been hit by the Lean Startup advice, MVP stands for Minimum Viable Product. Eric Ries, the author of “Lean Startup” book, defined an MVP as that version of a new product which allows a team to collect the maximum amount of validated learning about customers with the least effort. The point to stress upon here is that of “least effort”. This also translates into “quick” and “cheap” in my mind. So you have a brilliant idea. Right? How do you now go about validating whether your set of target customer (s) would want your product or service? This is where you need to get to work on your MVP. I should clarify here that you don’t necessarily always “build” an MVP. I will elaborate this in a subsequent section. AirBnB : AirBnB made a very big assumption that home owners would open up their house to complete strangers to earn some money. Dropbox : Dropbox made an assumption that users would be comfortable uploading their personal files from their computer on the cloud. Zappos.com : Zappos made the assumption that people would be willing to buy shoes online. This is a big assumption that they made as people usually would prefer to wear the shoes, touch and feel the shoes before buying. Your startup idea also would be having some underlying assumptions that need to be validated first. A simple way to look at these assumptions is to look at what “questions” your customers would have that need to be answered before they take their purse out to pay for your service or product. How do you know that the customers are comfortable with the assumptions that you are making and have their questions and apprehensions answered? How do you even know for certain that you have identified all the assumptions and questions? This is where an MVP really comes in. An MVP lets you take your idea to your target customers and lets you validate your assumptions, lets you get customer feedback and lets you understand the apprehensions that your customers have. An MVP also lets you really validate whether you have identified the right target customer for your product and service. Now I would like to elaborate on what would constitute an MVP? Going back to the definition and the objective of making an MVP, we need something that is cheap, quick, least effort and gives us the maximum learning. The other point that I want to clarify that you don’t have to necessarily always “build” an MVP. You can easily put together an MVP too with things that are already available in the market. Lets take some examples of MVPs built by companies to validate their idea. AirBnB : AirBnB just put together a simple website and targeted a very narrow target audience to get their idea validated. The website did not have options to select multiple dates, locations or prices. They just targeted one demographic: tech conference attendees at a single sold-out conference. You can read more about AirBnB’s MVP here. DropBox : The founding team of Dropbox just put together a 3 minute video that walked a customer through the concept of cloud based file storage and how the product would look like. This is all that was needed for them to get 75,000 customers interested without even writing a single line of code. At GoFloaters we had to create a simple product video for our launch in a new city. We neither had a lot of time nor the budget to outsource the work. Biteable video maker tool is what we used to create a quick 1 min video for the launch event. 2. Zappos.com : Nick Swinmurn, the co-founder of Zappos just put together a simple website with pictures of shoes from shoe stores near his house. When an order would come from a customer, Nick would run to the store, buy the shoes at full price and ship it to his customers. As you can see from the three examples above, each of the companies adopted an MVP strategy to validate the assumptions that they had made before they made bigger investments. The other point to highlight is that DropBox did not build any piece of software even though their idea was a technology based idea! This is why a MVP need not be built. It can be put together with things that are available. Another example to quote here is that of GoFloaters. I agree that we are not in the same league as the giants mentioned above but it is a good example and is worth sharing. GoFloaters made a big assumption that startups and freelancers would be comfortable working at cafes and would be willing to pay for the space usage. We needed a simple MVP to validate this and get customer feedback. With the inputs of my mentor Mr Sukumar Rajagopal, we decided to launch our service on WhatsApp. We built a simple website and put our WhatsApp number out there and asked users to send their space requirements to us. We would then respond back to them with locations and pictures of the place. If they liked it and wanted to book, then we would send them a InstaMojo payment link. We ran this MVP for about 2 months to validate our assumptions, perform pricing experiments and to gain customer feedback. Each iteration of your MVP has to add some value and it should allow you to get customer validations and feedback. 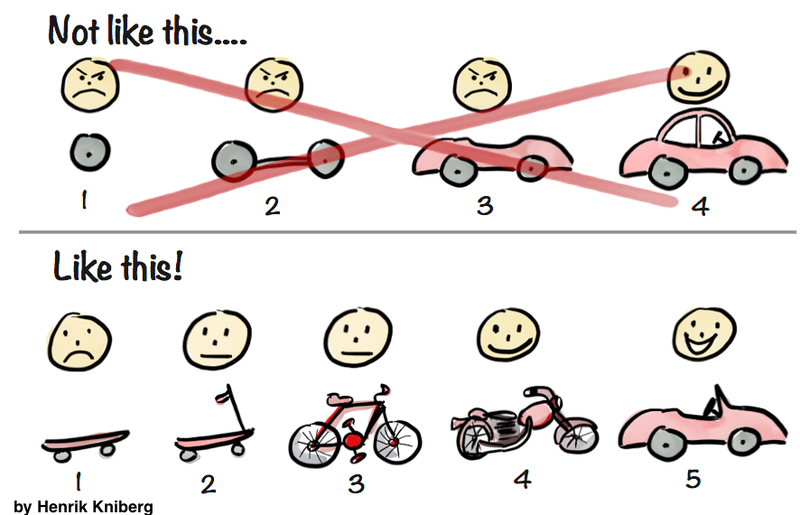 This image below illustrates how you should approach building / making your MVP and how you should not think about it. In my prior corporate avatar, I was running an innovation lab at a large MNC. Our job was to re-imagine the future of insurance at this innovation lab, take it customers, get their feedback an explore possibilities of doing a pilot. We tried various ways to build out MVPs. What I am sharing below are some of the “cheap” ways in which we have put together simple MVPs and what I have seen other startups do. Simple sketches : Simple sketches will do sometimes. Just bring your team together, brainstorm on the idea, visually represent the idea as sketches and take it to the market to get feedback. Don’t worry if you are straight lines are not straight or your sketch of shopping cart does not look like a cart. The beauty of a simple sketch is that customers and even your friends dont hesitate to provide feedback as they know that you are showing them something that is in its raw form and that you have not invested too much time and that you wouldn’t feel bad if they gave you feedback. MS Powerpoint (or better even KeyNote) : This idea could be an extension of the previous idea. You can take the sketches that you have drawn and put them into a slide deck. You can create your screens using Powerpoint and Keynote templates for web and mobile and create a mock of your application. Powerpoint and Keynote also give you the ability to create hotspots that on tapping which you can take the user to another slide. The best thing about Keynote is that you can export the presentation as a clickable HTML files. The links work too! This essentially means that you have a clickable prototype MVP ready with just Keynote. Videos : Videos are another simple and cost effective way to show your idea to someone else visually and get their feedback. Hey this is what Dropbox did and it worked for them. It may work for you too. MS Powerpoint and Keynote decks can be saved as video files. This is the cheapest way to create a video. This is how we created GoFloaters’ first explainer video. You can also use free version of tools like Biteable, Powtoon and Vyond to create videos of various kinds. Yes there is a small learning curve but it still would need less time and money than what you would need to put together an app. MVP ideas for eCommerce startups : Like Zappos if you want to test if your customer would buy “X” online then you certainly need to go a little bit further from sketches and videos possibly. Before you put in lot of money on your slick mobile app or build an ecommerce site with the latest and greatest of technology, you can do this first. Use services like Shopify, Woocommerce or Magento to set up your first version of ecommerce site first. You can also look at website builders like Wix or Squarespace that also provide you with ecommerce plugins. For a hackathon that I was part of, we used Shopify to build an ecommerce site for selling customized headphones for audiophiles. You may think that these options often limit you when you want to do many features. Well, that is true but you dont need all the bells and whistles to be in place to know whether your customer would buy “X” online. You can set up an ecommerce site using some of the services mentioned above very quickly. If you are not a techie then these services are a blessing. MVP ideas for service startups : If you want to test out your service startup idea, then you could potentially go the GoFloaters route. You don’t need to build an ecommerce site even. Just give the customers a channel through which they can request the service you are offering. This channel could be email, WhatsApp, Facebook Messenger, Facebook Page or even a simple telephone number. If enough customers request your service and are ready to pay for it, then you can built a slightly more sophisticated MVP using WordPress or Wix or Squarespace. One question may be bothering you at this time. Let me try and preempt it. Are you thinking how would a simple website with a WhatsApp number or how would be email based channel scale? The simple word of advice that I received from my mentor when I asked him this very same question was “In the early stages of your startup invest time and effort only on validating your assumptions and whether your idea is adding value”. He said “Only when you have crossed this stage should you think about value.” Think of it this way. You have two boats that you can travel in. The first boat is named “Value”. The second boat is named “Scale”. You cannot travel in both the boats at the same time. Can you? If you just distill the approaches taken by many successful companies, you will get the core concept that you need to validate all of your assumptions, validate your idea and get customer feedback in the cheapest and simplest possible way. Only have you have completed this stage should you go about investing more money on your product or service. There is much more to talk about this topic that I cant possibly do it one article. To read about what are the broad categories of MVP you can read this article. If you like to know more about other tools that you could use to build your MVP, then get it touch with us. I would also strong encourage you to watch Three Minute Thursdays videos where my mentor Mr Sukumar has talked about Learn Startup. If you have taken an interesting approach for your MVP, kindly share that as a comment to this post. It would be helpful for others who come across this article. Blockchain is the technology of the future. World over large corporations, governments and consortiums are investing large sums of money on exploring how they can use Blockchain technology to transform processes and create new business models. World over lots of stratups have started to leverage Blockchain as their primary technology for their business. Blockchain engineers, developers and architects are on high demand and in the future the demand is about to increase multiple fold. The workshop is being organized by GoFloaters (www.gofloaters.com). Your trainer for the day would be Mr Seetharaman. Seetharaman is a IBM certified Blockchain Consultant. He has developed many applications on Blockchain for global companies. He leads a team of 20 Blockchain developers at an MNC company based out of Bengaluru. “Friday night dinner a? Not possible da. I have to go to office”. These are all the things that either our mind voice tells us or we tell others. The fact of the matter is that you and me spend more than 2 hours on the road every day commuting between office and home. While some of us can switch jobs and some of might shift homes, is that the real solution to this problem? It is a given that IT companies or for that matter any large company is no longer going to build their office inside the city. So what is the way out? I was a corporate employee for 16 long years shuttling back and forth between West Mambalam and Siruseri. This travel was one of the reasons that made me think beyond a corporate job. We loose so much of our productive time to traffic and travel. We arrive home half dead not having the energy to take care of things or even spend time with our kids. We thought why not re-purpose GoFloaters for that corporate employee who wants to stay near home and work on those days of the week where traveling to office is not mandatory. This gave birth to our “Hot Desk on the Go” solution. With a few design changes to the platform we were able to roll this out quickly. We are in the pilot stage with a few startups that are using this service to give their employees the flexibility to work from anywhere without compromising on productivity. If you are interested to be part of this pilot or want to leverage this service for your team / employees, write to us at [email protected]. In India we have quite a few coworking spaces that have come up. While most of them started out to provide office space options for small businesses, startups and freelancers some of the big brand ones have gravitated towards serving bigger companies. I recently read a report that talked about this trend Why the co-working industry is gravitating towards large companies and SMEs. Out of the 12 million seats, 10 million is earmarked for enterprise customers. It makes sense financially for big brand spaces that have crores of investment into real estate trying to catch the big fish to sell out the space in large numbers. Then I thought the smaller coworking spaces at least should be more startup friendly. To my astonishment I found out that some of the smaller coworking spaces are also saying teams need to take minimum 5 seats and some even saying that you need to take 20 seats minimum. This is a worrying trend according to me. If all players slowly gravitate towards the bigger fish then how would startups, freelancers and small businesses get flexible and cost-effective space options? Depending on the size of your company you should look at the right place for you. Some brands might try to get you in cheap and then put a service retainer clause and lock you in. If your business and its growth is unpredictable, which is true for most startups, then my advice would be to get an office space anticipating the worst case scenario. It is best not to spend too much on office space in the early stages of your company. If your worry is about retaining talent because your office is not so great, then my answer to that is do you need that employee who is more interested in swanky interiors than in building something awesome? After looking at various posts and answers on Quora we put together a checklist that lists down all the points you should consider while looking for coworking or shared offices. You can read about this checklist and how to apply it to your business here : The Definitive Office Space Checklist – GoFloaters. Making the right adjustments early and regularly is what separates successful businesses from the ones that fail. The best feedback that you can get on your business is from other entrepreneurs who can give you unbiased feedback on your business plan, marketing plan, sales plan, customer acquisition strategy and financial model. Each Business Teardown session will have one entrepreneur presenting about their business to 5 other entrepreneurs to obtain candid feedback and suggestions. If you are interested to get feedback on your business from fellow entrepreneurs or if you are interested to provide feedback to other businesses kindly register through the form below.